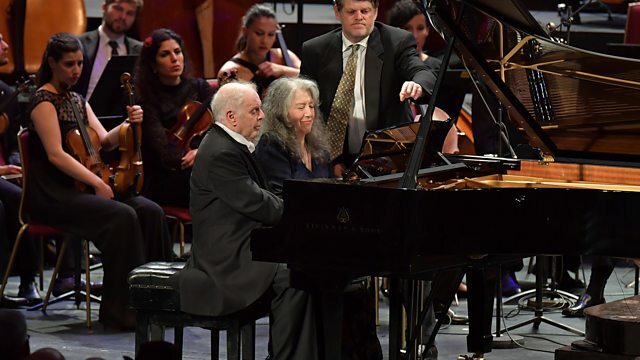 Pianist Martha Argerich joins Daniel Barenboim and the West-Eastern Divan Orchestra. Jorg Widmann: Con brio. Liszt: Piano Concerto No 1. Plus excerpts from Wagner operas. Martha Argerich joins Daniel Barenboim and the West-Eastern Divan Orchestra in a programme of Liszt, Wagner and Widmann. Christopher Cook explores Wagner's writing for the orchestra with musicologist Barbara Eichner. Recorded earlier today at the Concert Hall of Imperial College Union. Daniel Barenboim returns with his orchestra of young Arabs and Israelis, and with another iconic musician, Martha Argerich. Composer Jörg Widmann harnessed the energy of Beethoven's fast movements in the 'exercise in fury and rhythmic insistence' that is his Con brio. After Liszt's thunderously virtuosic First Piano Concerto, Daniel Barenboim - who conducted Wagner's Ring cycle at the Proms in 2013 - concludes with powerful excerpts from three of the composer's operas. Orchestra: West–Eastern Divan Orchestra. Conductor: Daniel Barenboim. Performer: Martha Argerich. Orchestra: West–Eastern Divan Orchestra. Conductor: Daniel Barenboim. Performer: Martha Argerich. Performer: Daniel Barenboim. Conductor: Daniel Barenboim. Orchestra: West–Eastern Divan Orchestra.